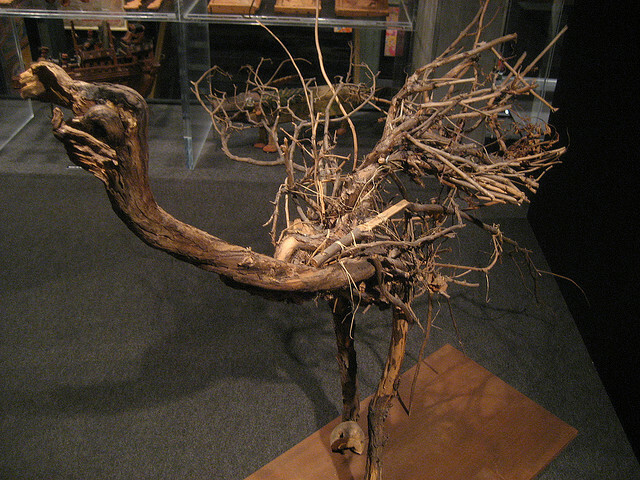 There are many ways to use twigs and branches in decorating your home that you may not have considered. Not only are these materials unique and natural, they are free too - great ingredients for a unique display! Bird themed table decor is hot news right now, as birds are becoming an increasingly popular addition to many areas of home decor. 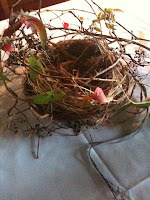 Creating a birds nest twig centerpiece is an easy and extremely natural way to bring this trend to the table. When creating a birds nest centerpiece from twigs and branches, it's important to start off with branches that are slightly bendy, and that won't snap the instant you try to manipulate them into shape. 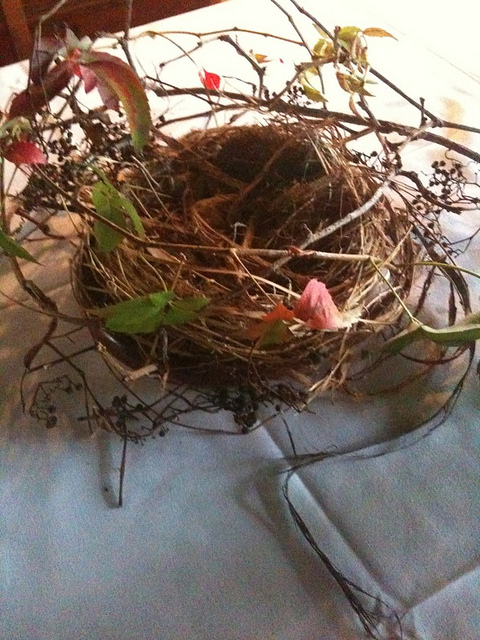 You can of course finish off the look of the nest with more rustic, brittle twigs to fill in the gaps. Start by building up a ring shape from a bendy branch, or two. Use florist wire to hold one piece of twig to another, and don't worry to much at this stage if the wire is on display - just focus on getting that initial shape. Once the shape is formed and you are happy it is sturdy (use some blobs of glue from a glue gun if you aren't), you can then begin to weave in and out, over and under this shape, using your other branches. This should then cover over any wire, but you can always add some more floral branches, or even a twig or two with leaves on to cover this up. Perhaps the simplest way to create a twig centerpiece is by sticking twigs and branches into a vase to recreate a tree-type shape. As well as being easy, this idea is also extremely versatile. Use a tall long vase for your branches, and it will hold your pieces in place to look like a trunk. Then when the branches reach the top of the vase they are free to spread, just like when they were on the tree. 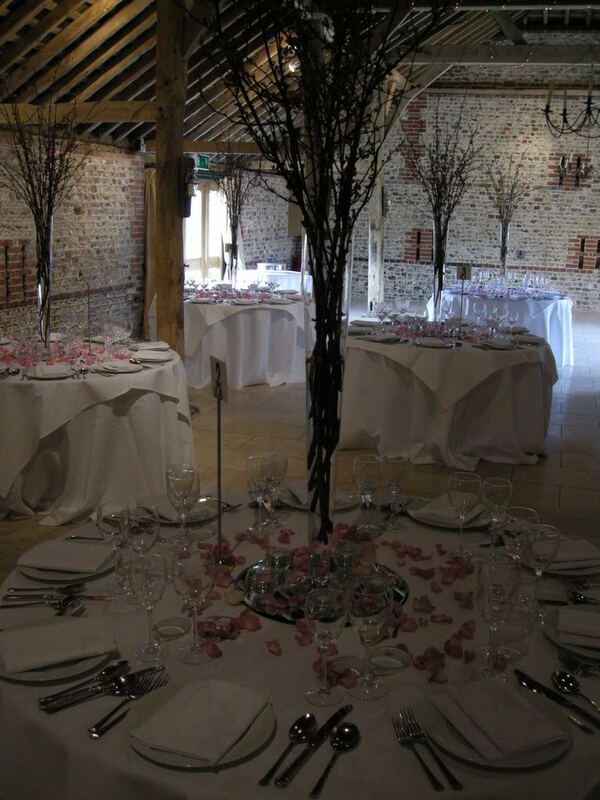 The advantage of this idea is that although it is a large centerpiece and will create a statement, the spread of the branches happens above the eye-line so your guests can still see one another. 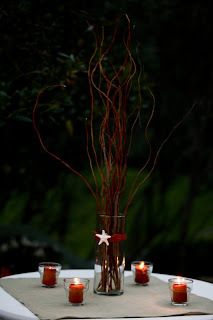 You can either leave the branches as they are in their rustic state, or decorate the branches according to your decor. Adding white paint looks particularly effective at Christmas, especially if it's for a winter wedding. The tree branch centerpiece on the right has used strings of crystals hanging from the branches to emulate a weeping willow appearance - you may find the use of glitter and diamond vase filler more appropriate to your needs, either stuck to the branches, or in the vase itself. Make sure the materials you use have some give in them. Choose a simple shape to begin with - birds and rabbits work well. Start with a good framework. Make your framework from chicken wire, to form the basic and largest shapes of your sculpture - it is easy to bend and manipulate into place, and each piece can easily be folded over each other to help it stay in place. Then you just need to weave your branch magic to create the basic shape. Details can later be added by using smaller twigs, and using strong white glue, or a glue gun - tricky pieces can be wired onto the frame. Use a thick branch, drill out some large holes and make it into a tealight holder. 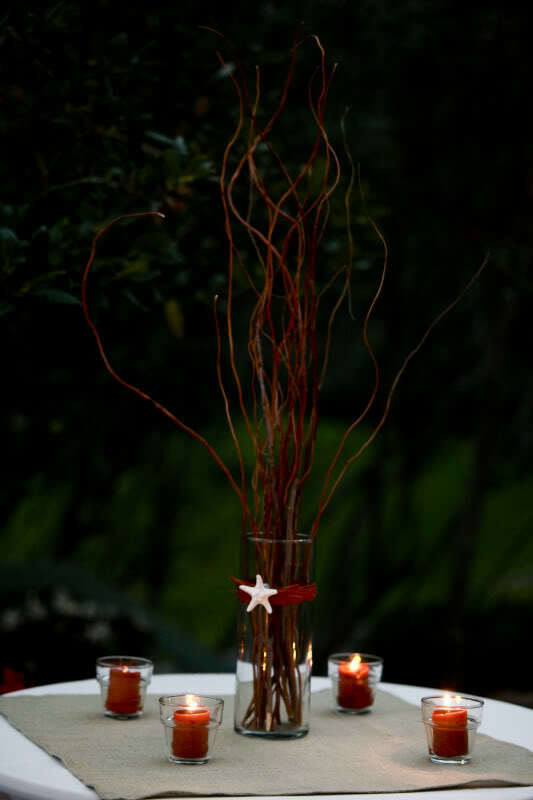 Use a slice of a tree trunk placed in the center of the table to arrange single flowers or some candles onto - fill in the gaps with short sections of twig. Continue the twig theme by making your own placemats or coasters with twigs. Cut up pieces of driftwood, or use twigs arranged in a glass vase. 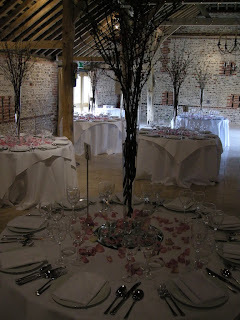 Then weave fairy lights in between, so the twigs act like a sort of lightshade. Whichever twig centerpiece or tree branch table decoration idea you choose, remember that you can combine many of these ideas on the table, but make sure the look isn't too rustic - soften the appearance with lights, candles and flowers.